Catherine Whoriskey who enjoyed weekend half-marathon success in Dublin. It was a busy weekend for local athletes with significant success notched at venues as diverse as Lifford, Dublin and Swansea. The City of Derry Spartans pair of Catherine Whoriskey and Una Gavin and Buncrana based Inishowen AC’s Pauric McKinney all made the podium at Sunday’s National Half Marathon Championships in Dublin. Another Spartan, teenager Fintan Stewart, contributed significantly to the Irish squad’s success at the Celtic Games in Swansea on Saturday while Sunday’s Riverine 10K in Lifford saw Foyle Valley star Scott Rankin go close to cracking the course record. Starting with the National Half Marathon in wet and windy Dublin and it was a great run from Whoriskey who added to her reputation and National medal haul with a 80m 32s run for the runners up spot behind the winning 78m 54s clocking of winner Laura Graham of Mourne Runners. A tough hilly course and the windy conditions clearly denied the Spartan a first sub-80m ‘Half’ but its another positive step in her progression and sets her up well to defend her Waterside Half Marathon title next month. Una Gavin came in well below the radar to claim her first National age group title, posting 1hr 51m 22s to lift the F55 individual gold. A big run from an athlete who has been battling injury in recent months. Inishowen’s hard man McKinney too has been in the injury wars of late but successfully defended his M50 individual title with a 75m 13s run for 17th overall and yet another National level gold to add to his collection. Fintan Stewart continued his successful season in Swansea on Saturday when he swapped his Spartans red vest for the green of Ireland. In the annual ‘Celtic Games’ meeting he scored maximum points with a 9m 07s 3,000m victory in the Boys Under 18 competition. A lot slower than his substantially sub 9-minutes recent clockings but it was a very tactical race with his sparkling last 400m propelling him to victory and crucial points in the Irish team’s age group and overall success over their Welsh and Scots opponents. 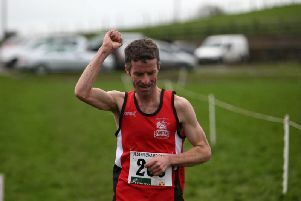 Foyle Valley’s Scott Rankin was in superb form at Sunday morning’s annual Riverine 10K road race, posting a great 30m 48s to lead home the 191 finishers but the windy conditions frustrated his crack at the course record. It was a brave attempt nevertheless for the in-form Rankin who was followed home by the Spartan’s Declan Reed, his 32m 50s reasonable enough as he works his way back to race fitness after an extended injury period. Age group prizes also went to locals Bill Duncan (M50 in 36m 57s) and Peter Lilburn (M60 in 38m 58s) with Foyle Valley M40 Terry Murphy grabbing the category runners up award with 36m 10s.